The boys and I recently had the pleasure of attending a teddy bears picnic with none other than the new bear on the block ‘Fudgy Bear’, thanks to Britmums working with brands. Fudgy Bear is soft, cuddly and a perfect little teddy from birth and definitely a friend for life. He really is adorable. Fudgy stars in his own range of educational picture books for children aged 1-5 written by Sarah Marley. Sarah created the stories of Fudgy Bear for her son Nicholas after a trip to the farm, the books make learning fun with the concept of reading the books to your child whilst they hold onto the Fudgy Bear, helping them to engage with the character in the story and build a bond with Fudgy. The event was held at Foyles Bookshop, Westfield, White City. My boys were really looking forward to meeting Fudgy and in the words of my eldest son ‘A real life author’. My four-year old, Joseph, is currently at Reception in school and is learning to read, he can recognise some words and knows all of his sounds and how to blend them, being one of the youngest in his class he finds it hard to concentrate and pay attention and interact in discussions in the classroom. I thought this opportunity of sitting in on a story telling activity would not only be a great experience for him but also aide in his learning, hopefully showing him that learning can be fun. I also wanted to see for myself how he reacts to story time in a group. Upon arrival we was met by the lovely PR ladies Katie Mclean and Liz Weston from Weston Communications, who both couldn’t have been more welcoming and nice enough throughout our time there. Being new to the blogging scene i was a bit nervous attending such event as i am not very confident in approaching and mingling with others but the team there made me feel very comfortable and at ease. My boys joined the other children on the floor and sat around Sarah while she began to introduce herself and Fudgy Bear. Fudgy was passed around the children so they could all have a cuddle with him while introducing themselves to everyone else. A life-size Fudgy joined us on the floor and the Sarah began to read from two of her books. Shy! My boys are not! I did although have to confiscate a balloon from Joseph as he wanted to have a balloon war with his big brother. Once that was out of the way he got stuck in with answering questions and getting involved with the story. Joseph really enjoyed helping Sarah out by showing off his counting skills and counting the penguins in the book ‘Fudgy goes to the Zoo’. This book was a favourite of all the children as they got to demonstrate their animal sounds, they especially enjoyed giving their loudest ‘ROAR’ when it came to the part about the Lion. The books are bright and colourful with each one introducing children to colours, numbers, animals, shapes and counting. Every photograph used in the books were taken by Sarah herself and instantly you can feel the love and care that she has put into them. Once story time was over it was time for a picnic out came the carrot and bread sticks, cakes, juice and little teddy shortbread biscuits which was a hit with the little ones. The children really were getting spoilt, with the children sitting down and eating it was time for the adults to mingle and have a little chat. Sarah was their to give advice on how to engage with you child in reading. Also at the event was Dr Amanda Gummer, a child psychologist from FUNdamentals and a huge fan of Fudgy Bear and who also works alongside Fudgy. The children got to have their photos taken with the life size Fudgy, Joseph instantly fell in love with him and couldn’t wait to own his own Fudgy to take home, he even presented Fudgy with an activity sheet that he coloured in. Joseph doesn’t normally get involved with craft activities and usually just likes to run around being generally cheeky (which he did too) but because the colouring sheet was of Fudgy Bear he couldn’t wait to do it which really surprised me and made me very happy. We bought our very own Fudgy Bear and ‘Count with Fudgy’ book. Joseph hasn’t put it down, he cuddled the teddy all the way home on the train and it has been to bed with him every night. Fudgy has even been on his own little adventure with Joseph to Nanny’s house. We had a fantastic day and felt very lucky to be a part of such a great experience. Thank you To everyone that was involved. 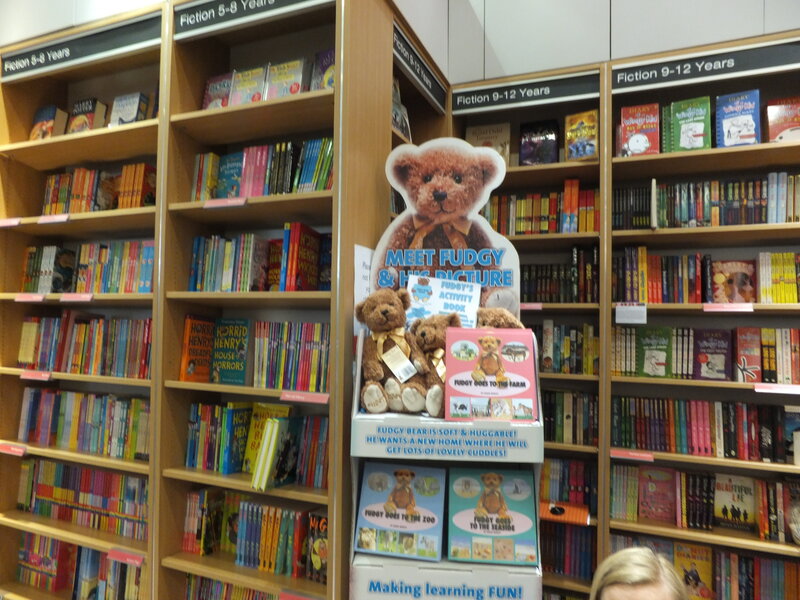 You can buy your own Fudgy Bear here for £15.99 and go on adventures with him here for £5.99. Today we was very privileged and lucky to be able to attend a book reading of Fudgy Bear written by Sarah Marley (which I will talk about in more depth in another post).